GM’s US market share peaked at 51% in 1962, thanks to Chrysler’s implosion that year. During the rest of the sixties and early seventies, its market share declined gently but steadily as Chrysler revived itself and import sales increased. But then starting in 1976, GM rallied again, and enjoyed a few final good years with 45+% market share, before its free-fall to today’s 17.8% share (2014). What contributed to that temporary rise? GM invented a new category: the affordable, mid-sized, personal coupe, which quickly became the top selling cars in the land. 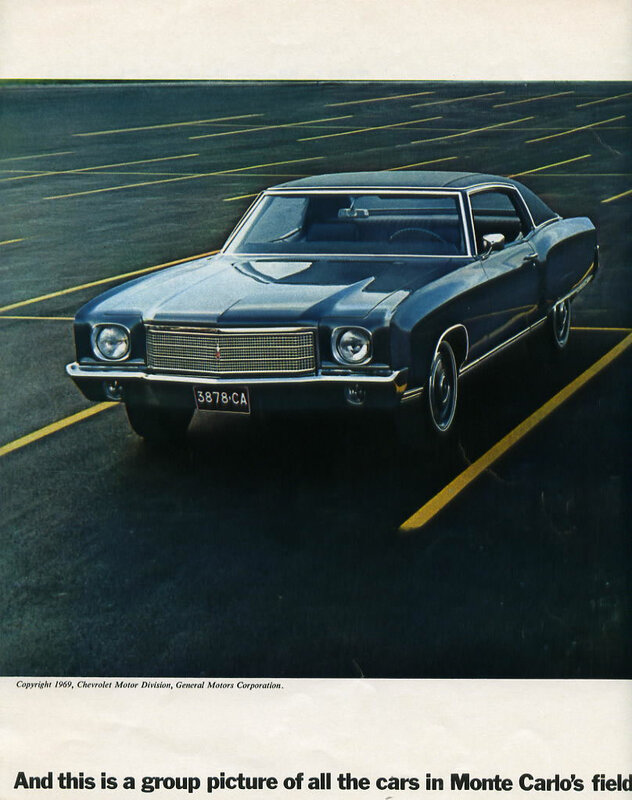 Chevrolet’s Monte Carlo was the most affordable of the bunch, dominated its sector of the category, and became a massive hit along with its massive (gen2) hips. But it got off to a rather more modest start, both stylistically as well as statistically, sales-wise. This new segment was pioneered by the 1969 Pontiac Grand Prix, and given its influence, goes down in history as being John DeLorean’s most successful car by a big margin. He took a prosaic A-Body Tempest/LeMans coupe, added six inches of wheelbase ahead of the front cowl, and gave it distinctive new sheet metal, including the longest hood ever seen on a car like this. It was a formula for success that would revolutionize the industry, as Americans ditched their dowdy sedans (or cramped Mustangs), and found automotive bliss. Chevrolet had been mulling something vaguely similar for some time, but when Pontiac’s GP showed the way to do it at very low incremental cost, Chevrolet saw the light, and cobbled up its own version of the “A-Special” body. 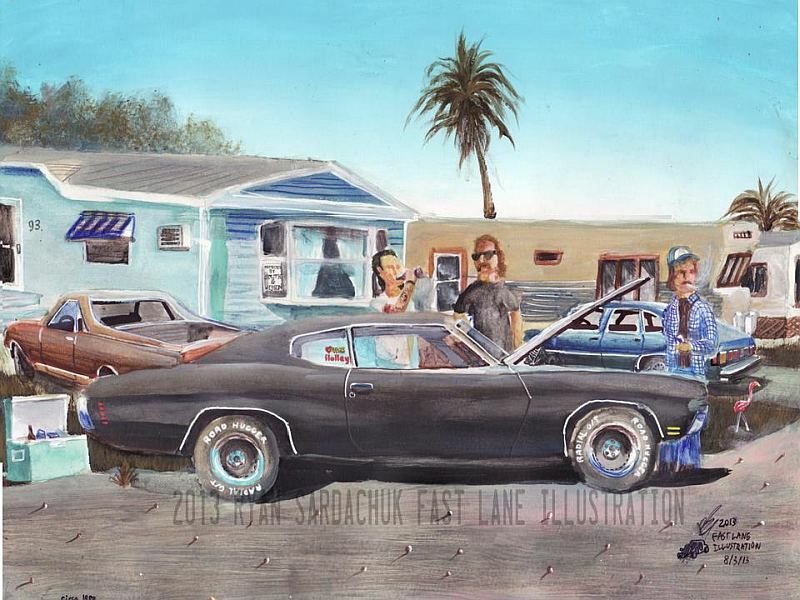 Like the GP, it’s mostly a Chevelle Malibu coupe lurking there; the whole roof pressing is shared, as well as many other parts and the interior. But it presented itself quite differently. The design is credited to the young Terry Henline, under the direction of Dave Holls. It’s surprisingly muted, both in comparison to the GP and of course the flamboyant gen2 Monte Carlo. The “hips” on the fenders were still delicate, compared to what was to come. Stylistically, I’ve always seen a certain kinship with the 1971 Cadillac Eldorado; Chevrolet had a long history of looking like a junior Cadillac, going back to 1932. 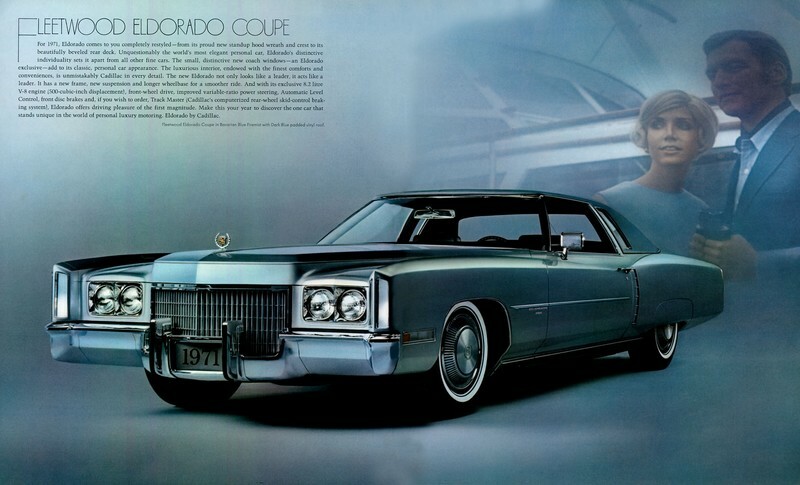 Of course, the Eldorado came out one year later, but there weren’t exactly a lot of secrets within the GM studios. Regardless of whether that was intentional or not, clearly Chevrolet saw the opportunity to build and sell a Chevy-priced Eldorado. This is how Chevrolet saw its Monte Carlo: in a field by itself, without any direct competition. 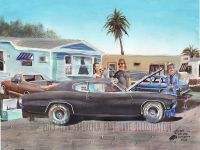 The Grand Prix was priced 28% higher, thus a step up from the Monte Carlo, which cost only some $200 more than a comparably-equipped Chevelle Malibu coupe. This was the potent formula that created one of the biggest successes ever: a (perceived) luxury coupe with a long hood for just a few dollars more than a prosaic “regular car”. 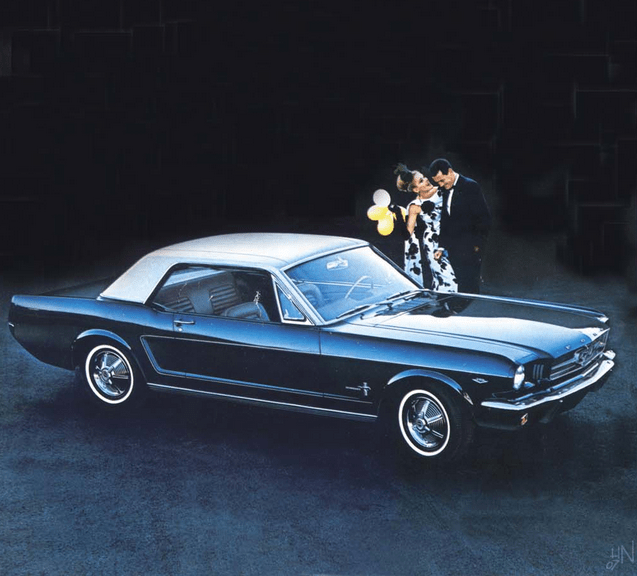 Needless to say, that was of course almost precisely the same formula that Lee Iaccoca used in 1964 with the new Mustang; essentially a Falcon with a long hood and some sporty-luxo touches. GM turned the tables on Ford, in a rather logical next step: when Mustang and Camaro owners got tired of their cramped pony cars and were ready for something bigger, quieter and more comfortable, GM had exactly what they were looking for. Ford’s market share began to falter right about the time the Monte Carlo and company dominated the sales charts. Is it too much of a stretch to suggest that Lee’s stock with Henry Ford II began its decline when GM came out with the Mustang’s logical successor? Lee had been know as the brilliant creator of new market niches in the 60s; this was the new market canyon, and Ford was caught snoozing. And had to scramble to stay in the game. The Monte Carlo’s interior was very slightly upgraded form the Malibu coupe; it used the round-gauge instrument cluster as used on the Malibu SS, with some GM plastiburl applied. The seat fabric was a tad nicer, but bucket seats or Astro-Back divided seats were strictly options. The Monte was more about external appearances than any real inner luxury. At least there was no six cylinder under the long nose, although that is somehow perversely appealing. A 250 hp (gross) hp 350 V8 was standard, along with a three-speed manual. That was probably a rare combo, as these were inevitably automatics. The venerable Powerglide still saw late-life duty behind the two 350s, but the new THM 350 automatic was available too, on all engines, as well as a four speed manual. No manual with the 454, oddly. Optional was a 300 hp four barrel 350, a 265 hp two-barrel 400 (small block), and the 330 hp big block “400”, actually with 402 cubic inches. Either way, these engines all looked lost in the Monte’s mighty engine compartment. The fan duct looks like a wind tunnel. And there was also a rather understated SS454 package, which included a mildly-tuned 365 gross hp 454 (7.4 L) big block and THM automatic, as well as performance oriented suspension and other upgrades. But the MC SS454 was a sales dud; only some 6,000 were sold in 1970 and 1971, and then dropped. Buyers who wanted a Monte Carlo were interested in other things, quite obviously. A 350/350 equipped regular Monte Carlo was a pleasant-enough car to drive, if not exactly inspiring. GM had entered its “handling era”, although that would be more noticeable in the new front suspension geometry of the gen2 MC. Still, the gen1 MC, like all these GM A-Body coupes, handled reasonably well for the times. And isolation from road noise and harshness was good, thanks to body-on frame construction and GM’s long experience with optimizing it for that effect. The power train, if equipped with the THM 350 automatic, was excellent: smooth, quiet, reasonably powerful; it was as good as anything being built in the world at the time for the intended purpose. The 350/350 combination became the de-facto standard for American cars for years; too bad it was spoiled by the down-scaled V8s and automatics to come. 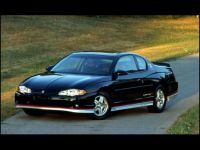 But during the gen1 and gen2 Monte Carlo’s reign, millions of these coupes powered by the 350/350 combo did their job effortlessly and without complaint, for the most part. And the Monte Carlo even had standard disc brakes. As the title makes clear, the gen1 Monte Carlo (1970 – 1972) was reasonably successful, but nothing like its bulging-hips successor. 1970 sales got off to a solid start, with 146k units. 1971 dipped to 129k, but that was due to the effect of the 67 day UAW strike against GM in the fall of 1970. 1972 sales increased to a more substantial 182k units. But these sales numbers pale in comparison to what was to come. The new 1973 hip-hopped that up to 291k units, and in 1977, the Monte’s best year ever, a whopping 411k were bought by eager buyers. That put it just behind the Cutlass Supreme coupe, which was the best selling car and coupe that year, with 422k units. Add in the GP and Buick Regal coupes, and GM sold 1.3 million of these mid-sized personal luxury coupes in 1977 alone. Of course, GM’s new down-sized B and C Body cars were off to a good start too; in 1978, GM had a 45% market share, but from then on, it was all downhill. 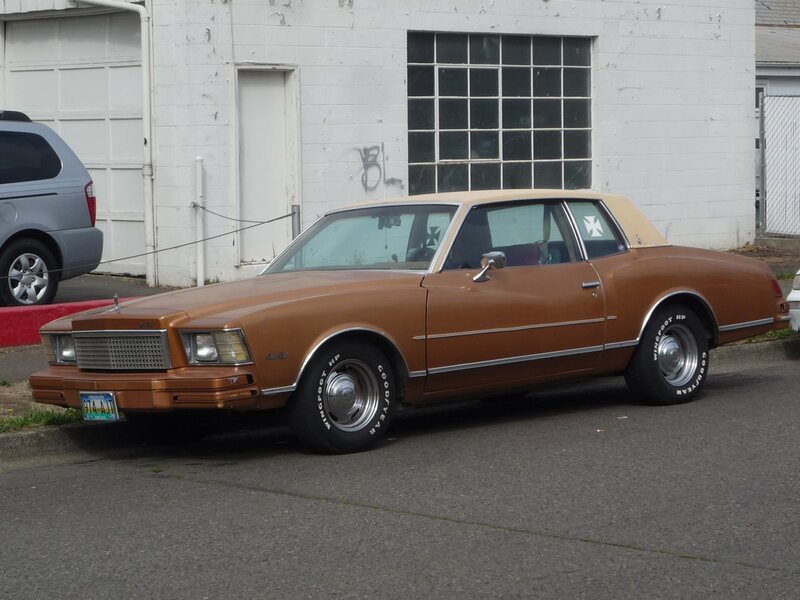 The Monte Carlo was substantially downsized in 1978, now sharing the same 108″ wheelbase with the Malibu. It was still RWD and BOF, but lost some 800 lbs in the process. How well the already somewhat controversial looks worked on the stubbier body was questionable. But initial sales were good; an impressive 358k ’78s were sold. But in 1980, a difficult year, the numbers were less than half; 149k. And they never really recovered. A facelift in 1981 smoothed out the hips and lengthened the ends, but sales hovered around 100k per year until 1987, when they headed into a final descent. 1988 was the last year, and a mere 30k sold. The almost twenty year run of RWD Monte Carlos was over, as was America’s infatuation with cars of this type. Almost four million Monte Carlos of these generations were built. But now buyers had moved on, and the Ford Taurus and Honda Accord were duking it out for sales supremacy. But what a ride it had been in its best years. Monte Carlo: A segment pioneer, one of America’s best selling cars of its time, and a cultural icon. I’m a bit embarrassed to say that this is the very first Monte Carlo Curbside Classic of any of the generations we’ve ever posted here. And how many dozens of B and C Bodies have we had? It’s time to rectify that, starting with this very nice first year Monte Carlo I shot a couple of years ago. I’m guessing its youthful owner got tired of waiting to see it posted. Better late than never. The first gen Monte was the best looking. I think I liked the 71-73 Buick Riviera a little better though. Back in the early 90s, a buddy had a ’70 Monte professionally restored and upgraded. It was plain black, with all-black interior, and a big block…looked showroom new. I really liked that car. Nice car, the 1970-72 Monte Carlo’s are really starting to grow onto me and they’re my second favorite era of the Monte Carlo’s after the 1976-77 Monte Carlo’s (never liked the front end of the 1973-75’s), despite the 1973-77 Monte Carlo’s heavily outselling the 1970-72 Monte Carlo’s I seem to find more 1970-72 Monte Carlo’s on the road than I do with the 1973-77 Monte’s anymore. To me, the 1st and 2nd gen Monte Carlo are Dr. Jekyll and Mr. Hyde. For a “premium” of $200, it’s hard to understand why anyone would buy the Malibu instead of the Monte Carlo. The 1st gen Monte is one of the few 70s Chevys I’d love to own. From a “plain Jane”/bench seat model to a big block/full-boat model, there are no duds. The 2nd gen? I’ll never understand what so many people thought made them attractive. Incredible that GM’s personal coupes had such a huge chunk of the sales pie….and now you rarely see any survivors of that period. There used to be one of these, in red, in my neighborhood that never managed to park on the street where I could really photograph it. Thanks for rectifying the gross oversight of no CC Montes until now. 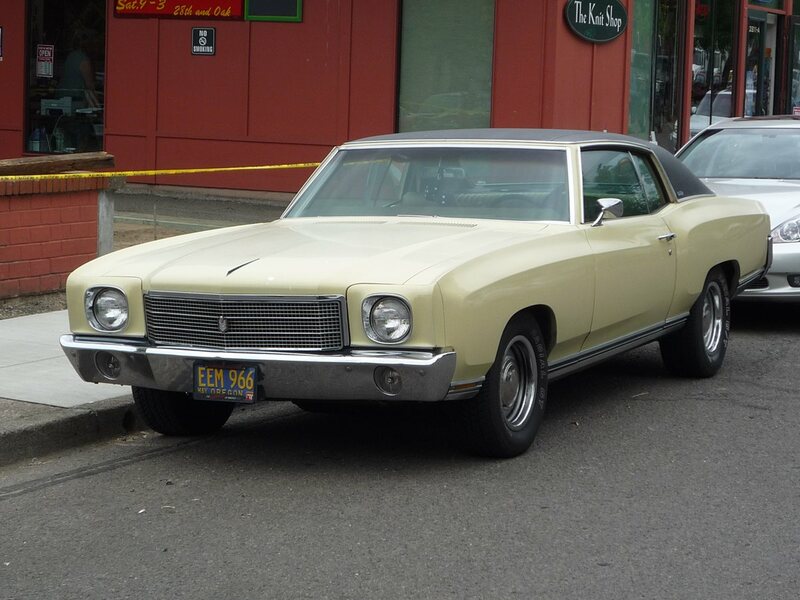 My first car was a ’71 Grand Prix and my cousin still has his 1970 Monte Carlo. The ’73 reboot had the unfortunate combination of being both ugly and most likely to be found in a trailer park owned by someone who aspired to own a Transcamaro (in the 80s, when I was forming my car purchasing opinions). The Grand Prix was also beclowned in the ’73 restyle but not quite to the extend of the Monte. I’m not sure if the wheelbases were decreased to match the original A-body they were based on, but if not then the overhangs certainly made them look as if it had. The GP lost its unique 118″ wheelbase in ’73 and moved to 116″, same as the MC (essentially the A-body sedan platform). 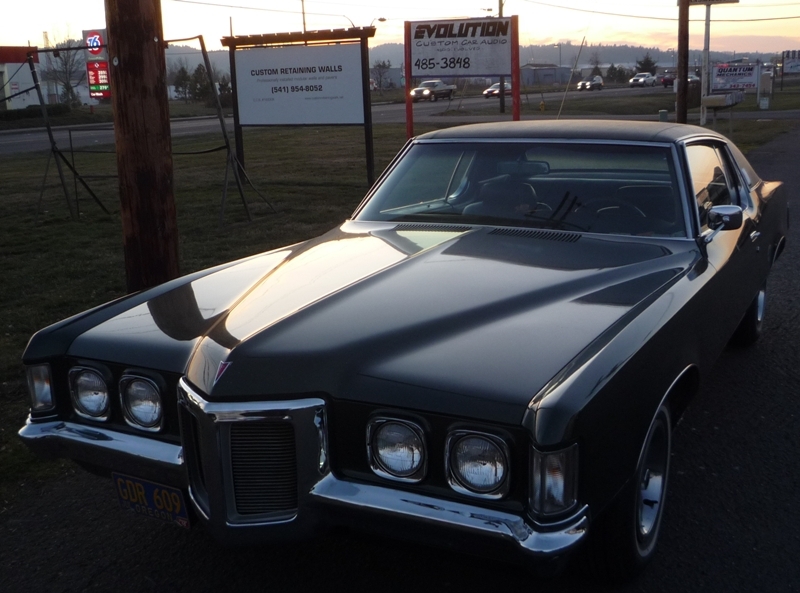 The Cutlass Supreme and Regal used the regular 112″ coupe wheelbase of the other Cutlasses and the Century. I know your trailer park reference was funny and I get it, I just hate it when a group of people are made fun of just because of their income bracket….please don’t get mad at me for bringing this up, I have always been one to defend the underdog and hate snobbery. I call bullsh*t on not decrying trailer living ~ I was too poor to be able to live in a trailer park as a lad , we suffered in trailers in the woods or on the edge of swamps and the people who forced us kids to live there were *exactly* the losers pictured here . For this reason I never looked at the Monte Carlo and in retrospect is was a pretty nice car . Monte Carlo – the original is still the best. Pillarless hardtops win every time! I recall that this car and perhaps the Grand Prix had the longest fan shrouds ever made for a car – regular gut buckets! I never got to ride in or drive one, but always wanted to. Just my style of cruiser. Make mine yellow or red… black vinyl top, of course! 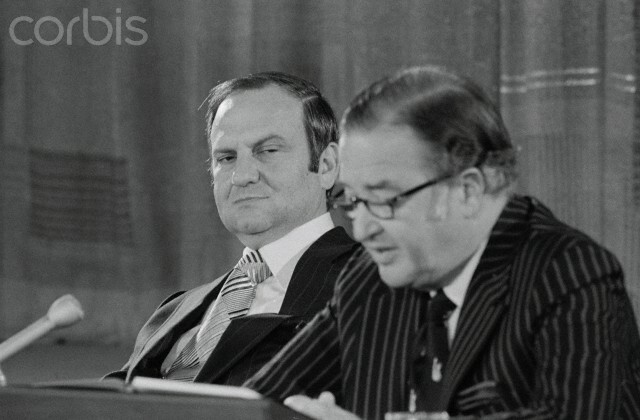 The picture of Henry Ford II and Lee Iacocca appears to be taken from 11 December 1970 when Ford announced Lee as the president of Ford Motor Company. A picture from that press conference can be found in the excellent book by Robert Lacy titled “Ford The Men and the Machine. The picture in the book is not this one that Paul has posted, rather it has a pensive looking Lee, hand on chin, looking towards Henry. This one is telling, isn’t it? Lee looks like he has bigger fish to kill. When he lost his showdown later on with Henry II, the meeting afterwards between Lee and William Clay Ford is an emotional one. A book worth getting if interested in the entire Ford story…..
Love the first generation MC. Would especially love to have the SS 454, the gentleman’s Chevelle SS 454, minus the stripes and cowl induction hood. You see a lot of the 1971-72 Chevelle’s design direction in that front end shot of the Monte. Excellent piece by Paul. David Holls is an unsung player under the Bill Mitchell umbrella. You have to wonder how much effect the Monte Carlo had on the 1974 Ford Mustang II/Cougar/Torino Elite. IOW, if the Monte Carlo hadn’t existed or been such a success, would the 1974 Cougar and Elite been produced, at all? It seems like they were built just to grab a slice of that Monte Carlo, personal luxury, brougham pie. Without the Monte, I could easily see the 1974 Cougar having been a derivative of the Mustang II, and the Elite not being built, at all. I have a hardcover 1973 Motor Trend “annual” around somewhere, which would have been published in late 1972. At that time, it’s known that the Mustang is in the last year of the current generation, but the speculation is that it will move to the Torino platform for ’74. 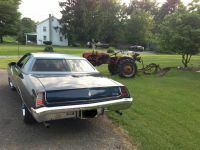 The ’74 Cougar and the Elite were direct responses to the success of the Monte Carlo and Grand Prix, although they weren’t differentiated as much from the mainstream intermediates (Torino/Montego) as the GM cars were. Ford sold nearly 97,000 Elites in 1974, even so, the Torino series (in which it was included) was down nearly 68.000 units from ’73. Chevelle was down 30,000 from ’73-’74, but there were another 312,000 Montes on top of that. Even with the added competition, the Monte was up over 21,000 from ’73. Okay, enough numbers for now. cover of. Really sinister photo! Cannot find online. When a co-worker had his 74 Vega at the dealer for some “work” he got a 74 Monte as a loaner. It was light blue with a dark blue vinyl landau top. It was an okay car, but I was surprised when this co-worker said he was considering buying it. 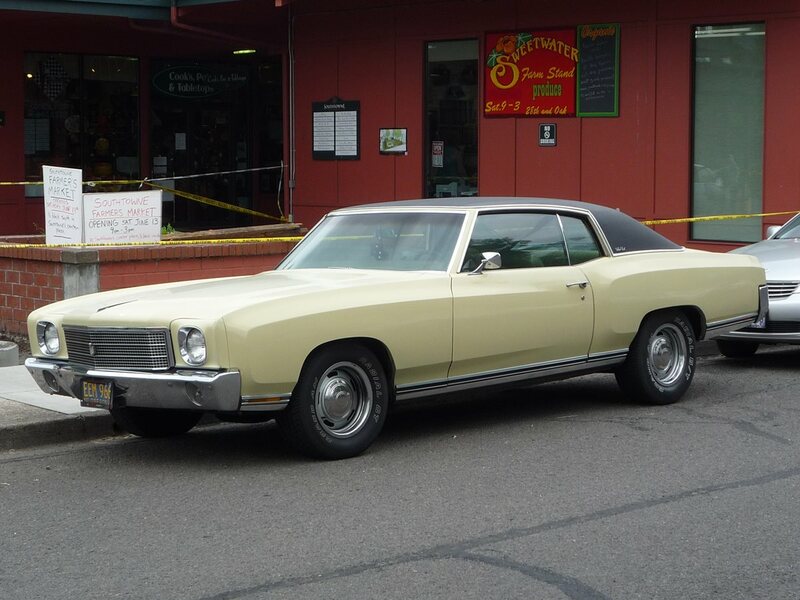 Another co-worker had a 73 or 74 Regal….nearly the same as the Monte but with a white vinyl roof. I thought that Regal was gorgeous, that Monte, not so much. BTW, my “little” sister has a 70 Malibu (307 with Powerglide) and these are nice driving cars. “Guilty pleasure” is a term that comes to mind when thinking about these cars, but on second thought, there is no real reason for feeling guilty about liking them. The first generation is quite well styled, with great roof and fender lines, which is shown best in the photo of the light blue example with the contrasting white roof. Coupled with being mechanically and dynamically quite sound by standards of the time, and the popularity of these Monte Carlos is understandable. There may have been a time when these had a “mullet mobile” image, but that was a long time ago. I see a well preserved example on a regular basis, because there is one owned by someone a couple of miles from me, and it is a very stylish car. At least one European critic quite likes the first generation Monte Carlo. UK automotive writer Quentin Willson included it in a book of his personal selections of 130 of the world’s greatest post-WWII cars. It was one of his picks for greatest Chevrolets of all time. I can think of others that I would have picked first, but I can respect his high praise for its styling. 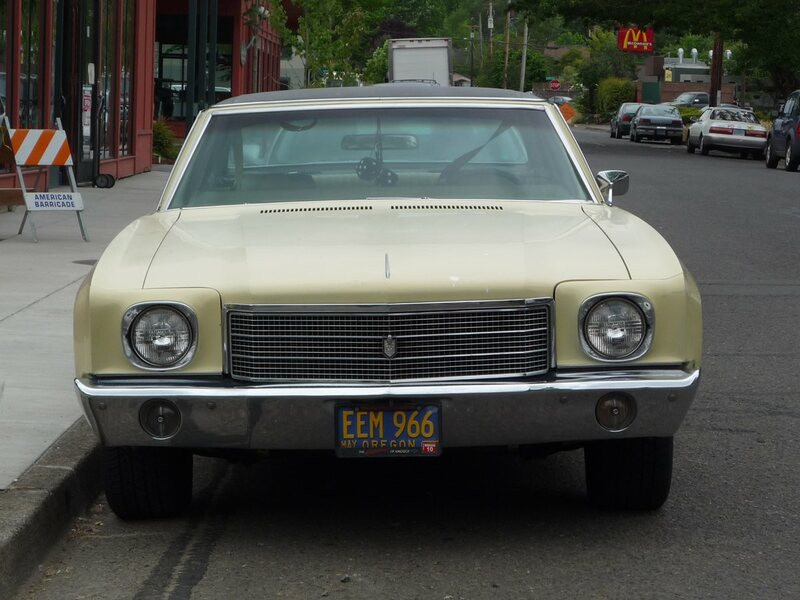 About 5 years ago, I struck up a conversation with someone who was driving a ’70 or ’71 Monte Carlo. It was a true survivor, and made for a great driver. It was pretty sparsely equipped inside. When he opened the hood, there was a 350 tucked away in the great expanse of real estate, but what caught my eye was the fan shroud. These are very well styled cars and the appeal is obvious. However any first generation Monte with fender skirts has had its styling ruined and the overall affect is hard on the eyes. Not the best move for timeless appeal. It looks like you could easily shoehorn a V12 or even a V16 into that engine compartment by shortening that fan shroud! Replacing that small block Chevy with a straight-8 from a 1930s car would be a great way to make fun of the omnipresence of small block Chevy transplants. 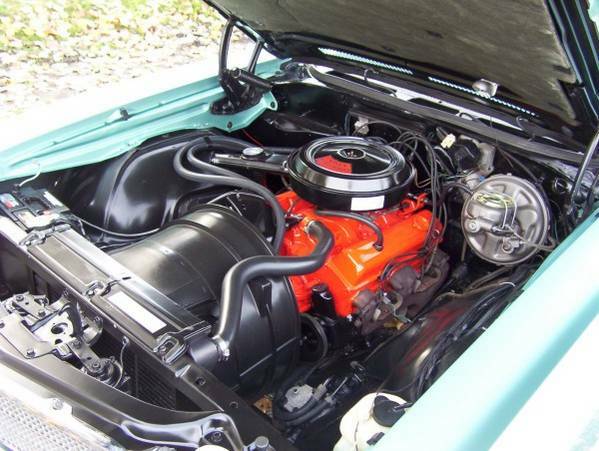 A friend had a 73 Monte with similar fan shroud, it was like a climbing expedition to reach the engine, so far back there. That radiator hose looks long enough to have been built by Alyeska. If you don’t mind; I’m going to add that picture to the post. It’s impressive! One can’t help but wonder if this is one the longest fan shrouds of all time. I’m sure there are longer ones on things like motor graders, but that is a totally different class of equipment. Possibly the ultra-rare 1976 Buick LeSabre V6. Absolutely, the first generation was the best: elegant proportions, modest, refined styling and still easily affordable. Then, that hideous second generation, about which the less said the better. I recall thinking at the time “how could they do that to the Monte Carlo?! ?” But, my taste wasn’t mainstream, and GM laughed all the way to the bank on those monstrosities….so what do I know. 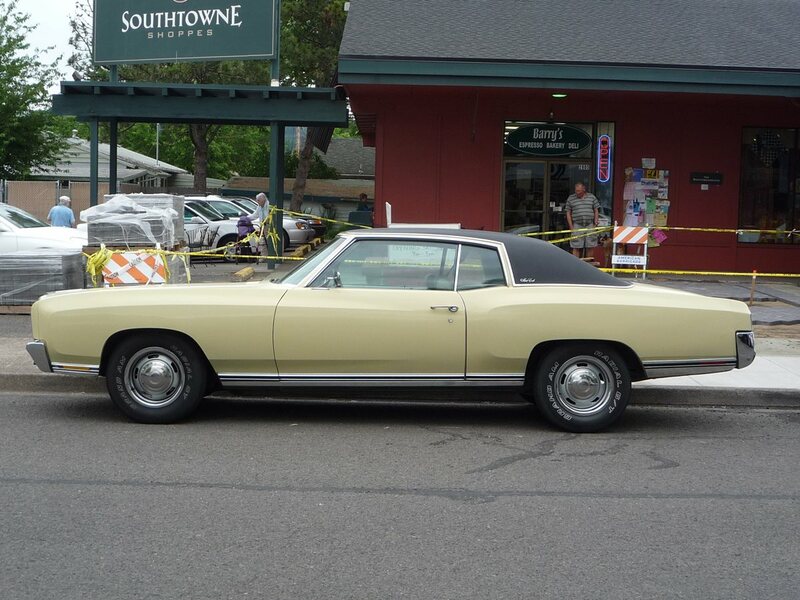 I do know the 1970-72 Monte Carlo looks wonderful as a convertible. The few that enthusiasts have converted are knockouts! 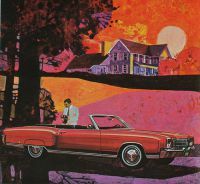 A Monte Carlo convertible appears in the 1970 accessories brochure. It must have been a fairly late decision to cancel it. Nice find. Now that you’ve shown that, it triggered a memory of hearing about how a MC convertible was a late cancellation. Rag tops were on the way out by 1970, and perhaps/likely the govt. had already announced plans to instigate roll-over regs. It’s a shame that it was never offered as an option. A four-door hardtop was also under consideration at one point. I recall once seeing a picture of one in a book, but I can’t remember if it was an actual prototype, a clay model, or just an artist’s rendering. I’ve seen that pic, it was a styling clay. It was felt the four door was not sufficiently distinctive enough from the Malibu sedan. Looked good though. In my dad’s 1970 MC Owners Manual, there was a page on ‘operation of convertible top’. But only the Cutlass Supreme A-Special body version was built. aka ‘G body’. The 1973 had vastly superior handling due to John Delorean and was considered much better looking too. Delorean actually “borrowed” suspension ideas from Mercedes. His last great hit. The first edition was done under previous management and had a low cost generic suspension, interior and exterior. I’ve always liked the 1970-72 Monte Carlo, I also like the 1973-77. Agree on all points. IMHO the early 2nd gen bug eyed ones probably had the best balance of retro lines (’30s&’40s) melded with modern styling before all the As and Gs had their faces flattened into vertical slabs and quad headlamps in ’75. The interiors were still a little tight but were way more distinctive and plush than their gen 1 predecessors. It would be interesting to see what they would have looked like had they had been released as planned for the ’72 model year before shock absorbing bumpers. I agree. 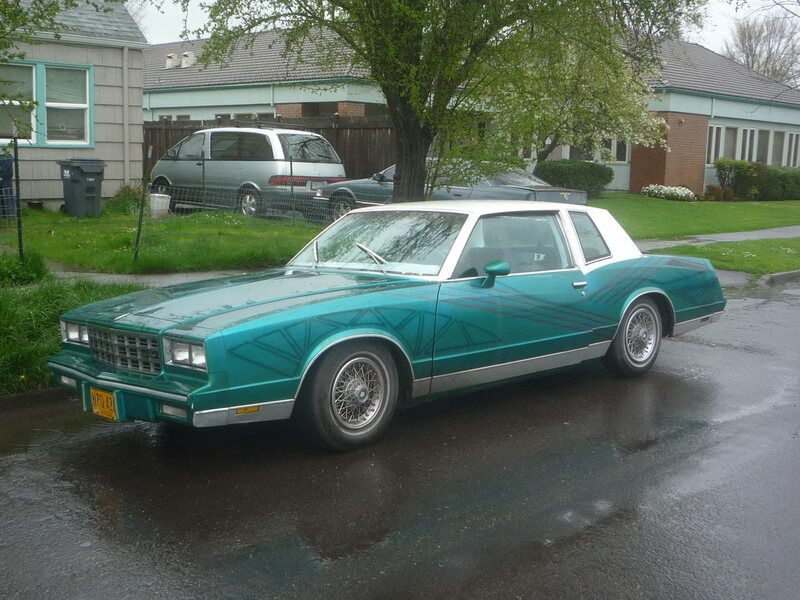 My aunt and uncle had a 2nd gen Monte Carlo when I was a boy. At the time, I thought it wasn’t a very attractive looking car, particularly with the vertically placed headlamps and the three story grille. It wasn’t bad looking overall, but I thought the three story grille and the vertical headlamps made the front end of the car ugly looking. I shoot the cars that I find on the streets. Yours wasn’t there. Scott, gorgeous car – great colors. Is that an Allis Chalmers in front of it? I honestly don’t know. I took the photo at my buddy’s house as I came to visit him one day and he wasn’t home. So I took the pic to send to him to show him I was there. Turned out to be a nice pic, but I have no idea what the tractor is. You really had to be behind the wheel of the 2nd Gen MC to understand its success. It rode very smoothly, handled decently, but the view over that well endowed hood made a man feel like a master of the universe. Or John Holmes. I am a sucker for the 78-79 Monte Carlo and dare I say I think it is the best looking. The 70-72 is a close second. I love the shot of the Monte Carlo in the parking lot all by itself. Back when I was a Chevy-obsessed brochure-collecting child, I had the brochure that photo was taken from. I don’t generally care for broughams or cars with lots of extra space in front of the engine, but I’ll make an exception for the 1st generation Monte Carlo. They are good-looking cars, especially the SS variety, which didn’t come with fender skirts! GM really was capable of building some beautiful cars. I only rode in one of these once, it had been T-boned hard on the passenger side and was poorly repaired. The door was really hard to close and it had some rattles. But it still was a nice riding car. Small block V8, THM 350, BOF, pre malise, you couldn’t really go wrong with one of these 70-72 1st gen cars. Interesting the sales were so low compared to the later and in my opinion less good looking later models. This would still be a nice daily driver even today. If I had the room and find the right deal I would love to own one of these. I still pine for my parents’ ’74, despite the polarizing styling. It was white with a navy blue top, matching navy blue velour interior, and the “Landau” option paclage with the F41 suspension. Under the hood was a 4-barrel 350. My parents were about to pass it down to me, but a carb fire put an end to that. I’m still bitter about it. Lots of love for the MC; me, it was an answer to a question I never had. I never understood why anybody wanted a tuna boat like this. Just huge and no room inside. The fan shroud!!! 2 feet of wasted space; but it looked ‘better’. 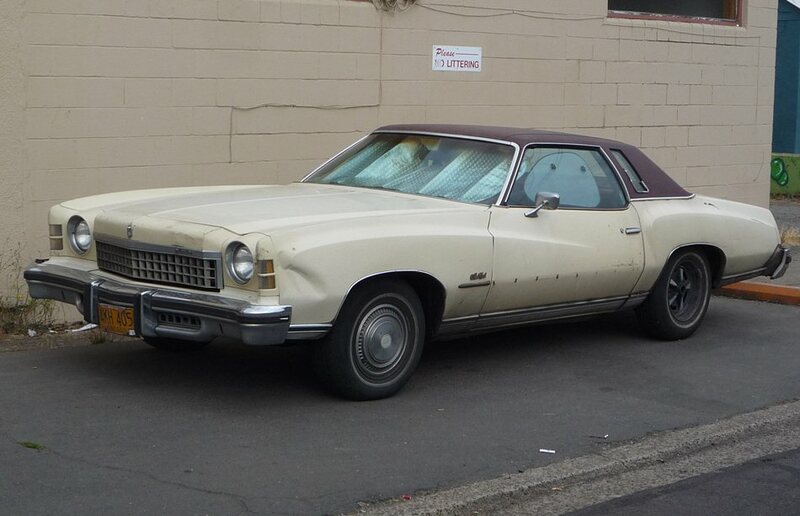 The brown one with the white Maltese cross stickers on the rear side window kind of epitomizes the lack of taste….. 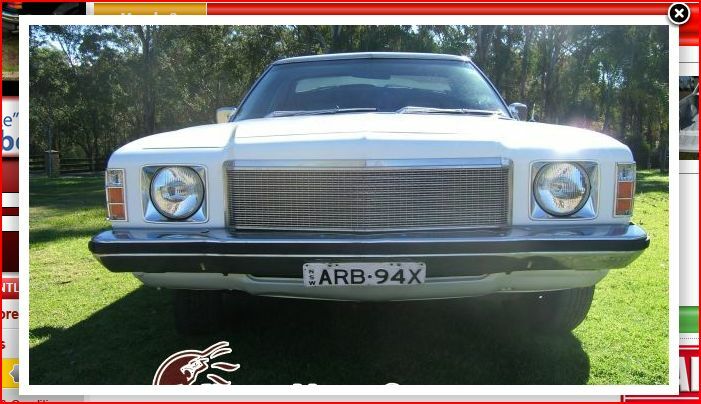 Curious how this Monte Carlo has dual headlights, just ten years after they were relegated to economy cars. Anything this size got quads. But Mustang used dual headlights too, so did copycat pony cars, so Monte Carlo’s duals confirm the formula: Chevy did a Mustang job on their midsized Malibu, just like Ford did with their compact Falcon. Ironic that Ford missed it. Vehicle size didn’t have much to do with whether a car got dual or quad headlamps. It was in what market the vehicle was designated. The ponycar field is a good example. The ponycars in the lower-priced marques (Ford, Plymouth, Chevy) all had dual headlights, while those from the same manufacturers, but in the more upscale divisions (Mercury, Dodge, Pontiac) all got duals. So it was with the Monte Carlo. For all intents and purposes, it was the entry-level personal luxury car from the lowest-tier GM brand. Thus, it got duals. If you wanted quad headlights, you had to cough up for a Grand Prix. Even when the MC finally did get square quads, they were awkwardly stacked, while the GP got a much cleaner-looking side-by-side arrangement. FWIW, the GP got dual headlights in ’71, meant to evoke ‘classic era’ roadsters, not meant to be a ‘cheaper’ feature. Buff books and “Ate up w motor” confirm this. Also remember the A-body Chevelle had quad headlights for 70, but went back to duals for ’71. So kind of arbitrary. Same for the ’71 Barracuda. Here’s a shot of my hideous 2nd gen bought in 1988 as a $1200 beater. Still runs great 27 years and 150K miles later. Real crap, these cars..
You’re not alone though Dean..for I own several of these “hideous” rides…”monstrosities” I believe is the correct term. One of them is a Grand Prix….a “beclowned” 1973 as another astute commenter stated. I almost traded it in on a dead Transmaro but the trailer park doesn’t allow non-running mulletmobiles. Kids, your opinions stated as “facts” are worthless & piss a lot of people off. No one (except obviously you) is having a problem distinguishing between opinions and facts. And calling people “kids”, when they almost certainly aren’t, is a sure way to piss off people. Do you call black men “boys”? Everyone here has the right to express their opinion as long as they don’t insult other commenters. You just did. Do you still have it? would you sell it? 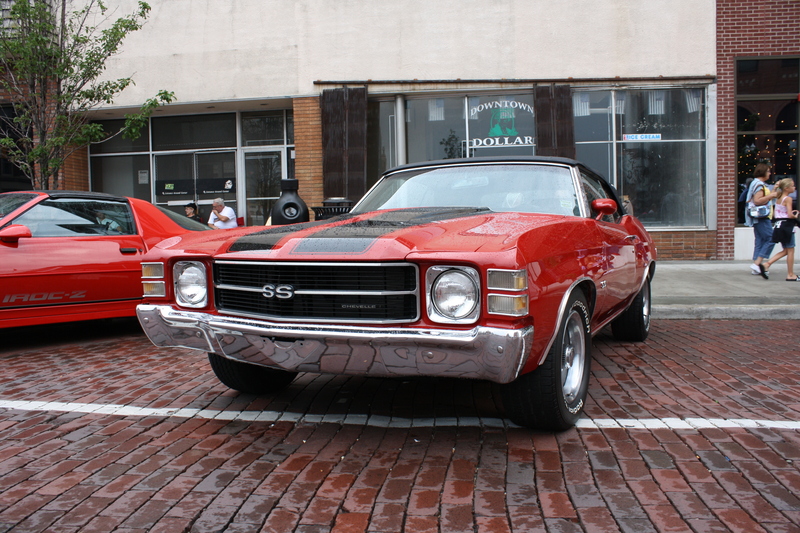 The 2nd gen was, of course, a close relative of my 1st car, the ’74 Chevelle. It was a ponderous beast, and the suspension/steering bits were obviously engineered for a much smaller/lighter car. Not a tie rod nor a ball joint could be expected to last more than 30k. Still rollin’ the original ball joints in my Beclowned ’73 Grand Prix bud with…uh… 156K! 🙂 Oh, and my ’74 Malibu does too…but it has 40K. Didn’t you state your POS Malibu had 300K on it before you dumped it? Or was that someone else? Not to diss anyone’s Malibu, but my Monte has required one centre link, two sets of shocks, front springs, and is up to 268k miles on the clock. No ball joints or tie rods yet, but who knows what it’ll need if it goes another 27 years! ALL those old Chevies had greasable ball joints and those few who greased them properly every 3,000 miles or sooner, rarely wore them out . As a young man I frequently used “drive-away” cars to move from place to place, working as a driver for a drive-away service. I think doing this is more common in Canada than in the US, as shipping cars by rail can be slow and pricey, and a lot of folks don’t have time for the multiple-day journey on the Trans-Canada. I landed Montes twice. In June 1989 I had moved back from the UK and, after staying with my folks back in Vancouver, needed to get to Ottawa to start a new job. My worldly possessions from Blighty were drifting back to Canada in three tea chests, but I also needed to ship a lot of other stuff from my folks’ place so decided to opt for the drive-away option. The car I was assigned was an 18-year old 1971 Monte Carlo with nearly 120k miles (Canadian cars went metric in the mid-70s). My Dad and I were suspicious – I was taking this car on a five day trip! But the agency said the 350 V8 had been rebuilt and the car was in fact in really good original condition….The interior was like new, and looked just like the image above except it had the goldish beige vinyl. Plain gold colour, and in fact the sales sticker was in the glove box with the owner’s manual (yes, I read the owner’s manuals – again, think about that five day trip). The car had originally been sold in Red Deer, Alberta, and it was definitely a “prairie car” – plain vinyl bench, AM radio (at least it worked), no A/C, no vinyl roof, wind-up windows….but the bigger engine. It drove just fine, although it would probably be utterly exhausting on such a trip by today’s standards. I enjoyed the adventure. Good power through the mountains, although above 75mph it would get fairly wobbly, mainly I suspect as it was wearing cheap “Atlas” tires. As I got into Ontario it started drawing attention, as rust had of course mostly carried off these cars in the east. In North Bay, Ontario, I stopped for a coffee and an older guy (well, I was 25 at the time) asked me all about the car, wanted to know if it was for sale, could I have the owner call him etc etc. Real enthusiasm. My earlier Monte adventure had been in June 1982, driving a 1979 Monte, the smaller (and I think quite attractive) versions launched that year from Montreal to Edmonton. I was 18, and it was a fun trip and my first drive-away experience. This Monte had the 305, also gold, with an attractive interior with bucket seats and a console shifter (3 spd auto of course). It felt posh to me as I was used to my little Fiat (which was lodging with my folks in Vancouver – not a cross-country trip kind of car and God help you if it broke down in Kenora). 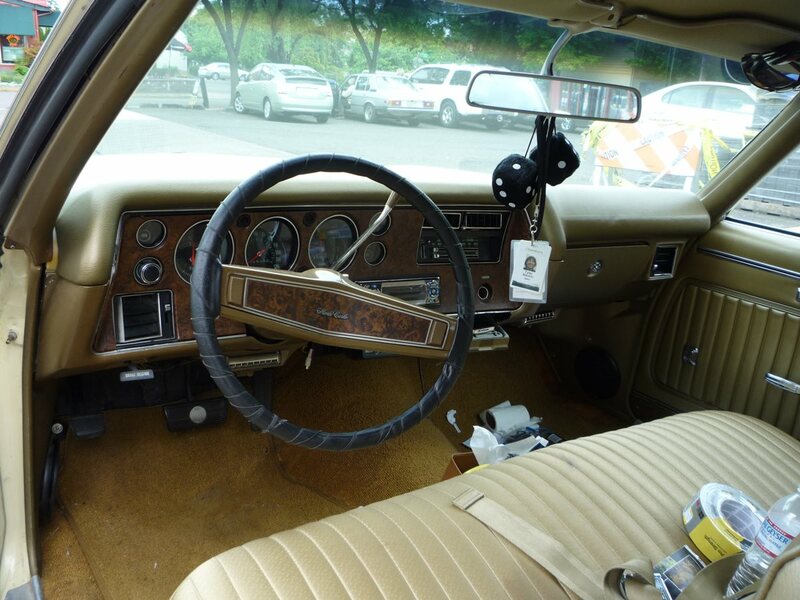 No a/c (plastic plugs over the outer vents – GM “classy” – and the archaic floor vents, of course) but am/fm/cassette…And the 79+ Malibus and their kin were IMO civilized drivers, as were in fact the Colonnades compared to the competition. I got pulled over while doing 150 km/h in the middle of Saskatchewan (the limit was 110, as I recall) but the RCMP constable just wanted to see the tags – the car had a Quebec transit tag in the backlight but no actual plate. Funny how few mainstream coupes there are now…In the 70s these were all bestsellers. Thanks for the post. Nice recollection of an interesting car we all took for granted back in the day…. 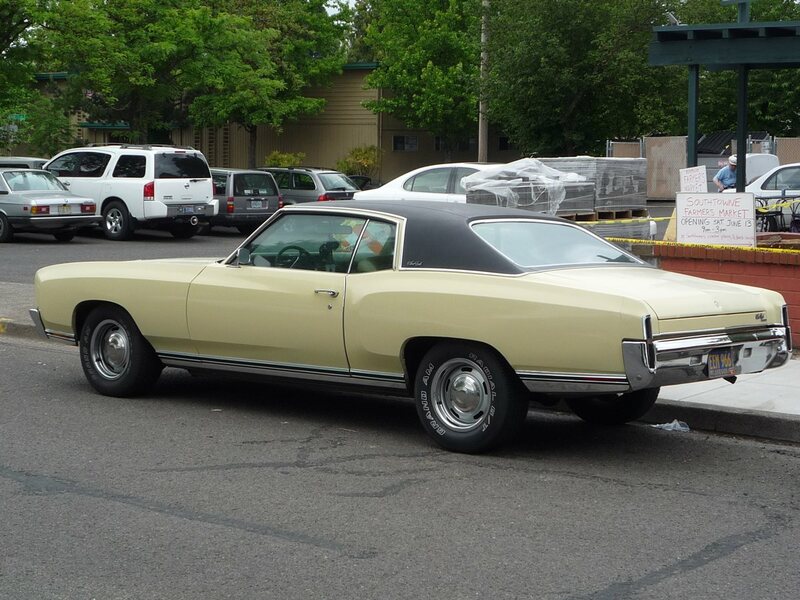 Had a ’72 Monte Carlo that otherwise looked the same as the cream colored ’70 featured in the article. Bought it in about ’86, with about 86K on the odometer. 350 2-bbl V8 and 350 THM. Black cloth interior with a bench seat. Loved that car & would still have it, had life not intervened. If I had the chance to do another 1st gen, I’d like to try one with a 402. I’ve never owned or driven a Chevy with a big block. 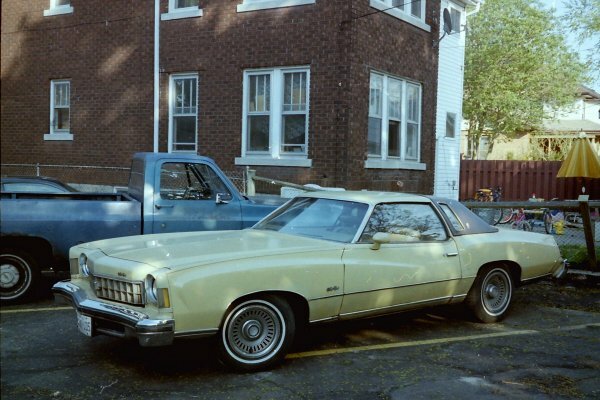 In the early ’80s, a good friend owned a ’77 Monte with a 305. Not a speed demon, but no slouch, either. Triple black, with a vinyl bench seat. Absolutely beautiful, smooth-riding car! Every time it comes up in conversation, he admits regret for not keeping it. IMO, the first year was the best lookin’ one of all. It’d be hard to kick a ’70 MC out of my driveway. 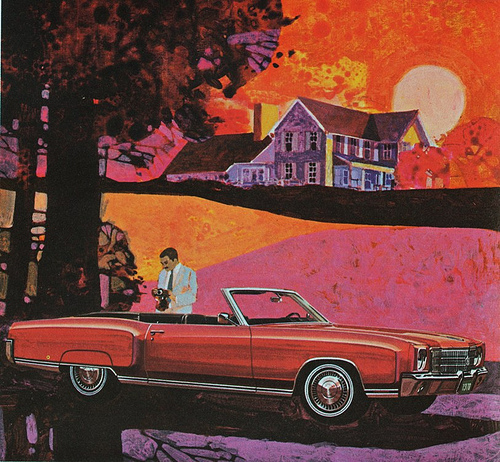 I was 13 in 1970 and riding my bike to the local Chevy dealer to pick up the latest brochures including the full-line accessories catalog that included the MC convertible. 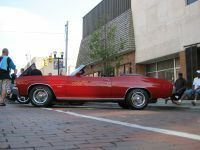 This past year at the local annual charity car show, a gentleman with a low-mileage numbers-matching red ’70 SS 454 showed up and we discussed the planned-but-never-built ragtop. “I swear I saw it in a Chevy accessory catalog” I told him while agreeing it was never produced…his position was that it wasn’t even on the drawing board. But the pic above proves it. I’d have to agree with the “late cancellation” theory. It would have been easy enough, as the MC used the Malibu middle body structure; the Malibu convertible’s top would have fit perfectly. But note that the 1970 Malibu convertible was cancelled too; ’69 was the last year. I’ve seen plenty of ’70-’72 Malibu (Chevelle) convertibles…are you talking about a specific model, Paul? Oops! I flubbed that.Or I should say that my Standard Encyclopedia did, as I grabbed it at that point to check, and it showed no 1970 Chevelle convertible. And I jumped to a conclusion that defied the reality of having seen them myself back in the day. Sometimes it’s better to trust one’s memory than a reference book. Update: I just checked my Encyclopedia, and it is listed, not surprisingly. Operator Error! My bad. I, too, have seen a few (what appeared to be) factory 1970 – ’72 Chevelle convertibles, including this ’71 SS. While Chevys don’t usually do that much for me, the Gen1 Monte Carlo is an exception. Most cars that came out in 1969-71 did not age that well, lookong quite dated after 2 or 3 years. The Monte was an exception, with a basic shape that cars would emulate for the next 15 years. I am not sure we can be too hard on Ford here. Ford had pioneered personal luxury with the T-Bird and the pony car with the Mustang. Those were two huge franchises, and it is forgivable that Ford did not see enough real estate between the two to slot another model. Chevy, on the other hand, had no T-Bird, and no ability to make one. They took an available platform and struck gold with it. Where we can fault Ford was in its strange plan to build compact and mid sizers on the same platform, making neither one all that appealing. The 70-71 Torino would not have made a very good basis for a serious competitor to the Monte. While I understand the appreciation of the first gen’s Monte Carlo for its clean lines, for me it’s a little too subdued. The front bumper especially looks like something pennypinching Studebaker would have come up with that could be hung at the front and rear of the same vehicle.The flamboyance of the second gen captures the Seventies perfectly. I’ve posted before that my family’s 1970 was best ever of the time. To my dad, driving in city it was a ‘sports car’ compared to our wagons. But it got totaled, :-(, I hoped to get it in HS. Also, Ford’s first answer to the Grand Prix/MC was the ‘Bunkie’ 1971-73 Mustang/Cougar. They had to know of GM’s plans and figured all they needed was a ‘bigger’ Stang. But the BOF ’74 Cougar sold better. Collectible Automobile says these were meant to be a Mercury exclusive, but Ford dealers demanded and got the Elite, then smaller ’77 TBird. The Gen 1 theme continued down under. Here’s a HJ Holden ute. 1974-1976. I’ve always found the first-gen MC to be quite elegant, and the second-gen to be a little overdone. But that’s just my opinion. (Am I one of the “kids” if I’m 34?) Perhaps unusually I like the facelifted second-gen better than the ’73-’75 cars, stacked quads and all, but that’s just me. I had never noticed until it was pointed out here, though, that the 1st-gen used the entire Chevelle roof stamping. Selective vinyl hid it rather well, but now it’s one of those things you can’t un-see! I like the first two generations of MC. The third generation MC looked less than attractive (IMHO) than the first two. Another tidbit, the Monte also shared its trunk lid with the 70-72 Chevelle, which was also shared with the 70-72 Skylark. The answer is quite simple: As stated in this Story People got the Chance to buy a car category that formerly only rich people could afford: the personal luxury car. I like the 73-75 best and the 78-80. The 81 is awful. Still I prefer the t birds from the late 70s. Driving a 2nd gen Monte up a parking garage ramp is an experience–you can’t see nothing but hood. Yeah…uh no. Just a gussied up 2Dr Lumina. No thanks.I’m good!